The lights in the arena go black. A green glow surrounds the ring. A loud explosion is heard followed by green flames shooting from all four cornerposts. Hasha Koroshiya's theme, "Gouka," blasts through the arena as his logo goes up on the X-tron. The lights come back on. The crowd boos loudly as Hasha makes his way down the ramp to the ring. He is wearing his full dragon outfit. The crowd starts chanting "Shotgun... Shotgun... Shotgun..."
King: Here he comes! The one, the only, Hasha Koromitsubishi! King: That's what I said! 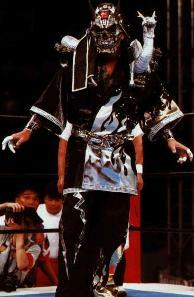 The Japanese Assassin is in the ring! Cole: He looks like a man on a mission. Hasha: Shout for the Schoolgirl all you want. Your little false Champion won't be coming. He's halfway across the country by now. I heard his little rantings last night. Why do you think he's the Champion? Is it because he's the best? No... Is it because he earned the right to be the Champion? No... Is it because he pinned every man along the way? No... You haven't beaten me Schoolgirl. You may have won the match, but the battle is JUST begining. Lawler: He's right dorkface. Schoolgirl hasn't pinned Hasha! Hasha: Maybe the skirted-one has blinders on? Schoolgirl, have you even seen "puroresu," or Japanese wrestling for all you mono-linguals? I follow in the steps of greats like Rikidozan, the father of puroresu. I am the student of Giant Baba and Antonio Inoki, both pupils of Rikidozan. They fought each match to the fullest. Cuts, bruises, sprains, black-eyes, concussions, broken bones and more. I wrestle the puroresu-style as my predesessors did. The crowd boos once again and starts to chant "USA... USA... USA..." Hasha walks over to a corner, climbs to the second turnbuckle and gives the crowd a two-finger salute. The crowd erupts back into a chorus of boos and chants for Shotgun. He steps down, takes off his dragon head, skakes his head at the crowd and continues. Hasha: You... I shudder to call all you fans. You EMBICILES show the ignorance of your false Champion. That should be CHUMPion. The Japanese wrestling federations don't hire on jobbers. That is probably why Schoolgirl has never wrestled there. He's afraid his skirt would have been torn, or he'd have broken a nail. Or better yet, actually have to wrestle instead of talk his opponent to death. Hasha: Every match I wrestled was against a top opponent. Every title I won was a title EARNED. Every time I went out to the squared circle, I knew my opponent was out for my head and my title. DO you know how har it is to win the Japanese Triple Crown? That's holding the major three Japanese World Heavyweight titles at once. I was the youngest person to accomplish this feat, at age 23. Again at age 30, and once again this past month at age 36. The crowd continues to boo. Hasha pauses a moment then continues. Hasha: Most Japanese wrestlers dream of winning the Triple Crown just once, the sign of a skilled wrestler. It is a feat only three other wrestlers have accomplished. I have won it three times. And after I won it the third time, everything I had to prove in Japan was done. I saw Marlow's open bid to join the XIWA, and accepted. I decided to bring puroresu to the United States to show all you slobs what TRUE wrestling is all about. Lawler: You tell him Hasha! I've seen the Assassin wrestle all over the world. Even shared a few tours with him overseas. He's just lucky he never had to wrestle AGAINST me! Ha ha! Lawler: Shut your trap, loser. Hasha's speaking! Hasha: I set a plan in motion Schoolgirl. Everything that has happened to you in the XIWA, has been a part of my plan, down to you wearing the XIWA strap. What better way to show your devoted fans that you are a chumpion, than to let you win the title, and humiliate you as you lose the strap to someone else. Then, to have me stand victorious over your broken body as I am crowned the new XIWA World Heavyweight Champion. The crowd goes wild. Cups, trash, hats and anything else fans can get their hands on are thrown at the ring towards Hasha. Hasha walks to another corner and climbs to the second turnbuckle. Hasha: You redneck, sister loving dropouts proved me right. You ARE embiciles. Come Carnage, Schoolgirl and his cripple partner Braka-my-leg are gonna feel pain. And Double Gay, don't get in my way or you'll really see what pissed off looks like. Oh, and one more thing. Kim Page, don't think you run the place just because Eric Sorrow put you in charge. Stay out of my business and you'll live another day. Hasha throws down the mic to a wild array of boos and chants for Kim and Shotgun. He exits the ring and makes his way up the ramp. He turns around, stops, then makes a slashing motion across his throat and points to the audience. Hasha is pelted in the face by a cup. Hasha walks over to the fan that threw it and sprays Gouka in his face. Hasha raises his fists and exits under the X-tron. Cole: It looks like Hasha has it in for his opponents AND his partner come this Monday Night Carnage. Lawler: You finally got something right for a change chump! Cole: It should be an exciting show King. Lawler: You said a mouth full, now all we need is some PUPPIES! Ha ha! Cole: Is that all you think about King? Lawler: Did I mention, I LOVE PUPPIES?